Summer has finally appeared in earnest, the mosquitos are thriving after months of rains, the slugs are eagerly attempting to eat as much as they can before they dry up, earwigs are hiding in every blossom. 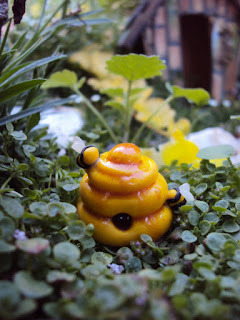 But there is one thriving insect that I am always happy to see more of, the Bees! The Bees are happily at work in the peas and the sage, waiting patiently for the catnip and lemon balm to bloom. 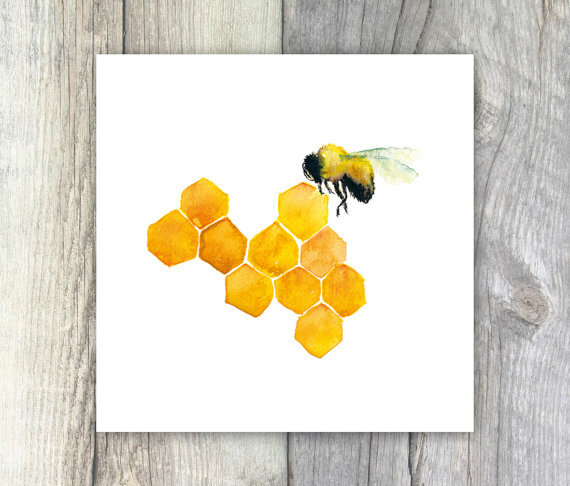 But they can brighten your house year round - lovely watercolor from TheTastyPainter. 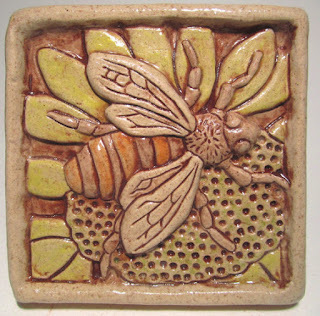 Or, a tile for an outdoor space. Perhaps to encourage them to hang around a bit. 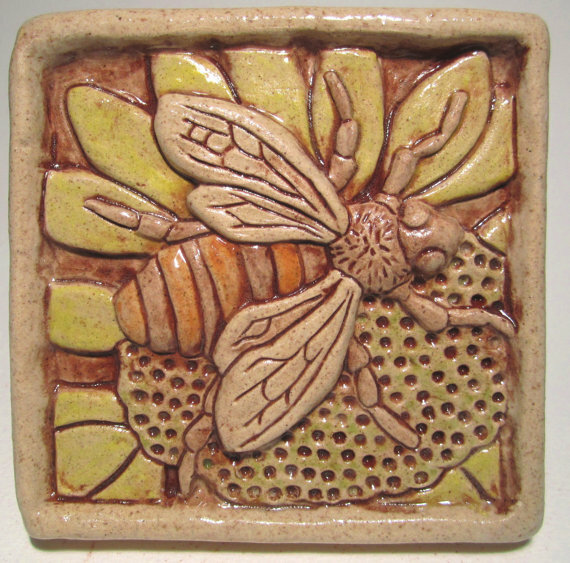 Handmade tile from Gianar, who also has several other colorways to choose from! When enjoying the garden in the morning, and letting those hard workers inspire you to jump-start your day, how about a handmade mug? 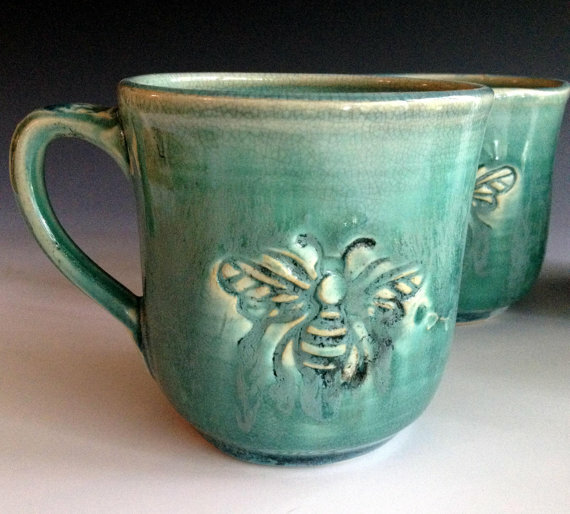 This stamped pottery with wonderfully flowing glaze from LeslieFreemanDesigns could bring that garden memory back year-round. For us crafty folks, you can bring the Bee friends into the house with your own needle and thread! (Well, actually that comes with the kit, but you get the idea.) 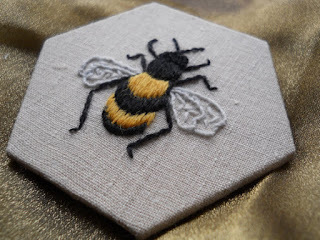 This kit from SarahHomfray is ready to become an easy crewel bee, and that hexagon mount is super sweet. If you want a bit more freedom in your creative endeavours, this amazing art yarn should spark your fingers to make something awesome! 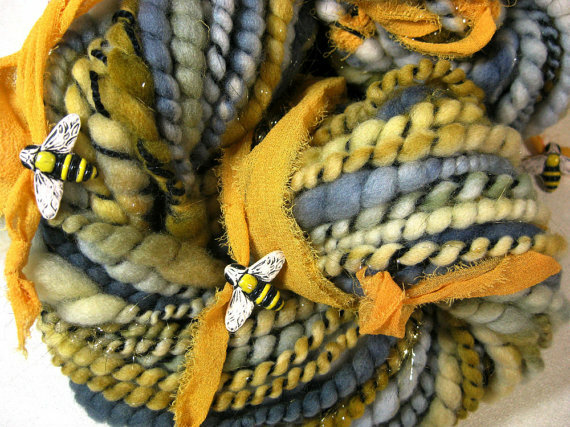 Spun by YarnWench, let those little bees become something strange and wonderful. We owe so much to the bees, the assistance in pollination, and the honey to boot! I'm always happy to see them finding a chemical-free, flower-filled, sanctuary in my yard!